Welcome to Fantasy Football Live Match Chat Gameweek 14. We are entering a busy FPL week with no less than 3 game-weeks covering the next 10 days. Game-week 14 kicks off tonight with a visit across the Severn for Wolves – Cardiff will be sniffing blood after watching Huddersfield tame Nuno’s pups last week. 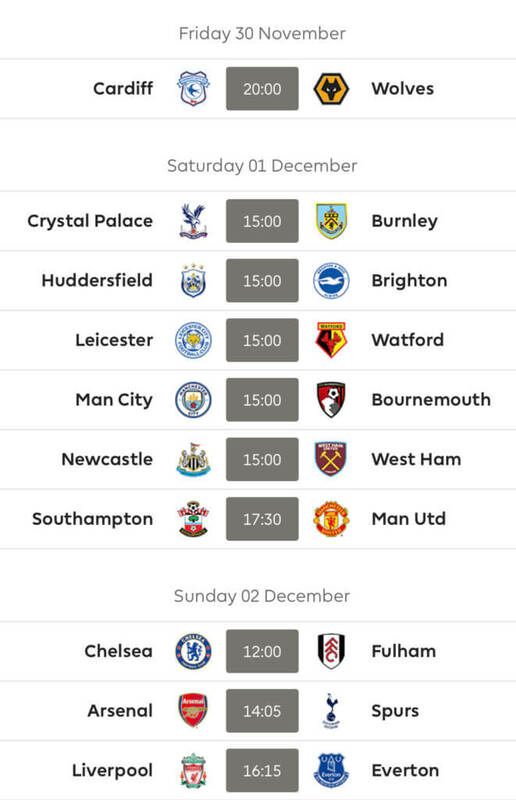 Saturday then brings us six matches – first up we have five 3pm kick-offs as Palace host Burnley, Brighton go to Huddersfield, Leicester welcome Watford, Bournemouth try and stop Pep’s rampant machine and Arnie and his Hammers limp up to Newcastle. The evening match sees Jose coming up against someone worse off than himself as United travel to Southampton. Sunday sees our final three matches of GW14 before thoughts turn to the quick turnaround to GW15! And it’s Derby Day all round as Chelsea host Fulham, Spurs go to Arsenal before Liverpool and Everton wrap things up for us. 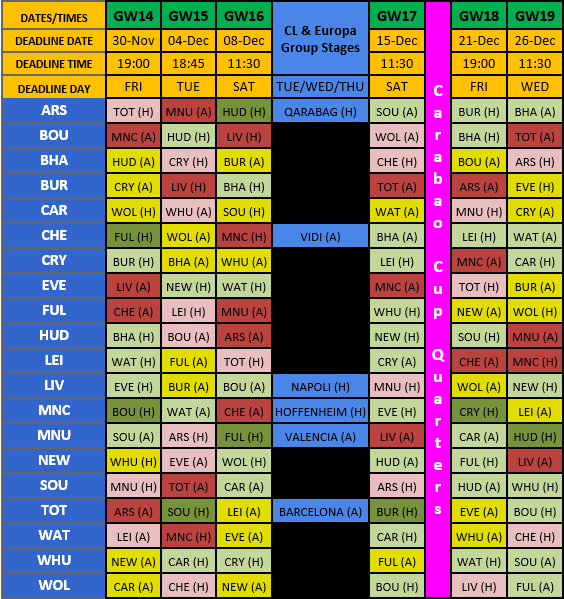 Good luck to absolutely everyone for Gameweek 14 from all at FF247! Thanks for reading Fantasy Football Live Match Chat Gameweek 14. Hi all! Not a great week, ended on 44 with others around me making ground in my MLs. Considering what to do with this lot, I’d like Sterling but want to keep a decent balance in the team. Would Sané be a good alternative? Suggestions on the team below. I’ve got 2FTs this week so happy to take a hit! What about just Salah and Kun to Sterling/Sane and PEA/Kane? Hi Pancho. Thanks for the advice! I’m just wondering whether I’m brave enough to go without any Pool attacking cover! Maybe a rush of blood to the head like Jan Vertonghen, but I’ve done a -4 just now. Looks good mate, strong score incoming. Hopefully Kunst. Good win for you guys today. We shot ourselves in the foot and always looked like on the back foot in the second half. Expected us to give that back three of yours a bit more trouble but we just didn’t have it today. I’ve got enough got Aguero to Kane but trying to think of possible ways I could do Murray to Auba and get Sane/Sterling. Forget the hits involved, I’m just brainstorming and might do the moves in 2 gameweeks. Where does Kun to Kane and Hazard to Silva leave you? Other than the obvious of not then having Kun or Hazard. Salah & Hazard out seems the obvious choice. Could maybe keep Haz if you downgrade Doherty. Bit stuck in what to do maunly because I’d rather sit back and make no transfers this week but I have 2ft so would make sense to use at least 1! 5. Anyone have any ideas? Other transfers floating around the grey matter are about Bilva to FelipeA and also Robbo to A.N.Other/TAA but think those sorts of transfers are best left for the WC! Also feel it may have been a mistake to bring in Martial but gotta stick with it for the foreseeable now I guess. Yes your right about Arsenal coverage looking good at the moment. Other thoughts are saleh to Sterling and Bilva to Mane week then Kun to auba next week? But wouldnt be able to get Kane in until I Wc then! I’m in a similar boat. Thinking Kane in this week, and Auba in next week for one of the cheapos/Salah out to fund it. Yeh I think I’m just going to stick to plan A and do Kun to Kane this week. Will still have 2ft next week and can make a more informed desision then! Yep, that’s where I’m at.